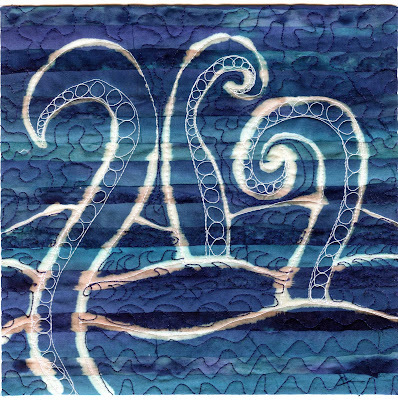 technique of the week – Page 9 – Cheryl Sleboda – Textiles. Technology. Texture. Teacher. This is a packaged product I purchased at a recent quilt show, and this stuff says it shrinks 30% in all directions. The package has really basic instructions on how to use. You sew your fabric onto this slippery nylon synthetic fabric. Then you steam the heck out of it and that shrinks the nylon and bunches up the fabric you sewed on. The nylon becomes a stabilizer of sorts, and you can sew this new “fabric” into your project. The thing was, once I had it “texturized” the fabric, I did not have any inspiration as to what to do with it. I did a series of fabric manipulations last year and did not want to repeat those styles, which left me completely stumped as to what to do with the “fabric” I made. Anyway, I also realized the “texturizing” is completely random. So if you like random, unpredictable results, this product is for you. I am not happy with the other circles in the darker purple thread, they were not dark enough and stitching over them by hand made them wonky. But, as my DH says, not every project can be a winner. Thanks so much to everyone for the interest and comments on the Technique #1 quilt, I do appreciate it so much! The idea for this week’s quilt came from an episode of Quilting Arts, Season 4. After watching Sue Kelly show how you could paint over a quilted surface with oil paintsticks, I decided on a faster approach with a “dry brushing” technique of my own. Paintsticks take 3-5 days to dry and cure before they can be heat set. Ths is done with fabric paints and cured in 1 hour. 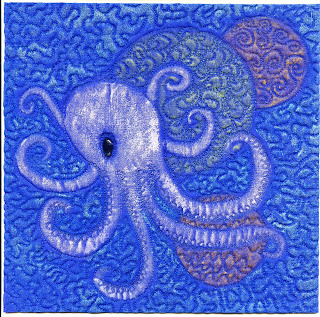 The Octopus was freedhand drawn with a chalk fabric gel pen, and then quilted over in Blue thread to match the background. 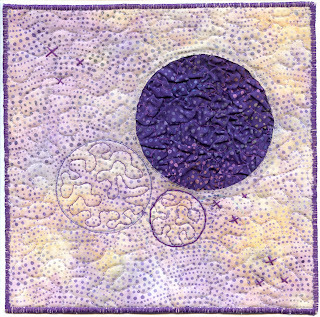 I chose dense quilting and a couple of bubbles to add interest to the background. Once the piece was quilted, I ironed it from the back so the front would have as much heighth as it was going to get. Using a piece of cardboard as a pallate, I daubed on some paint and got my paintbrush wet. Here is the “dry brushing” part, where you get a lot of the paint OFF of the brush and glide it over the “hills” of the quilting, leaving the “valleys” paint free. It takes a lot of passes witht he dry brush to get the amount of paint to show up. This was a lot of fun! This weekend I was in Zion, IL for a quilt retreat, and I needed a portable, yet artistic technique to try. 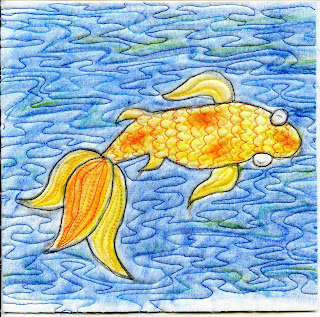 I got these fabric pastels at a recent local quilt show, and they are very much like using art pastels for paper. They are soft, get all over your hands, and smudge very easily. But they are pretty neat. 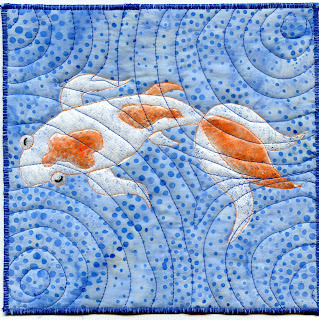 I used a white fabric background for this piece, and used my koi fish design from last week in reverse. Follow the directions about ironing, and be sure to cover the work like they say to. The dye will migrate to your covering surface, so make sure you don’t put it face down on the ironing board. I washed this with some harsh hand soap to see if the color would fade or wash out, and my wash water was clear and there was no fading! The fabric was slightly waxy before it would get totally wet, but still has a nice hand. The price for a set of these can’t be beat, so give them a try! So the LED light up squid got lots of attention from Craft blog and other various websites, and many thanks to the folks that commented and asked about the project. This week’s technique is taken from a book called Fabric Embellishing, in a chapter about discharging fabric. I could have used all of the methods in the book, but I chose to buy and try out a fabric bleach pen. The image is my representation of the Kraken. A new version of “Clash of the Titans” is coming out this year, and the 1981 version is a beloved movie of mine. My DH is playing God of War 2 on the PS3 and he also encounters a Kraken as part of the Greek mythology in the video game. So much to my surprise when researching this lil bugger, the myth of the Kraken is NOT Greek at all. It’s Scandinavian. And it’s a gargantuan size squid or octopus, not a reptile/man thing. This was interesting timing to learn this news, as we had just booked a Scandinavian cruise. So the “tentacle” of fate has reached out to me once again, and I could not pass up making a version of the Kraken. Things about this technique… Shake the bleach pen well before using. My first two tries the bleach was runny and bled much more than this final one. Also, work in a well ventilated area or use a mask, it’s still strong. Follow the Anti Clor directions well. And I thought the use of this unusual batik made for even more interesting discharged areas.